NEXT PLAYER 1 EVENT SET FOR FEB!!! Our next PLAYER 1 will be in February! Keep your eyes and ears open for the date! The featured game designers will be Chris O’Neill and Daniel Landis of KOBOLDS ate my Baby fame! 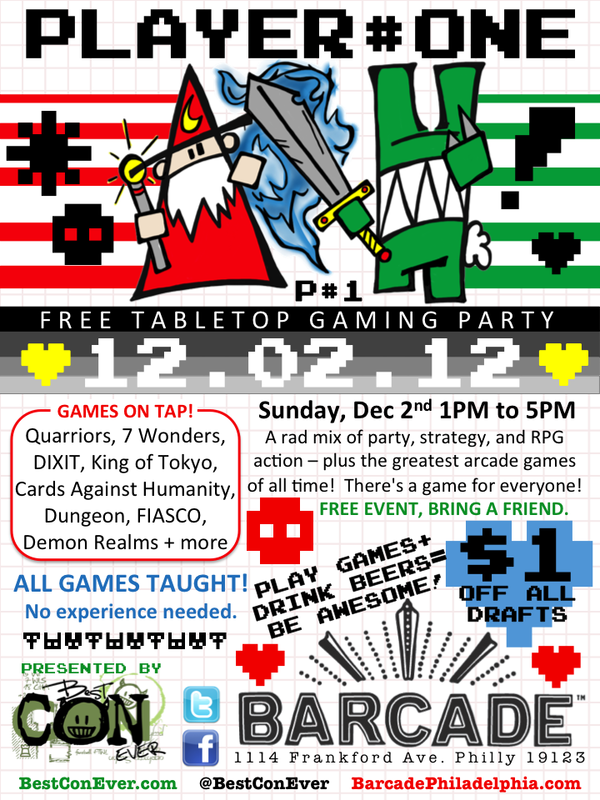 Join us for board games, beers, food, arcade games and fun!!! BEST CON EVER invites you to join us for another PLAYER#ONE event, this SUNDAY, DEC 2nd! We return to BARCADE PHILLY for the coolest tabletop gaming event in Philly! Beer and Food Specials. $1 OFF ALL DRAFTS! Sunday is BBQ day. Demon Realms (rpglike party game)! THIS IS A FREE EVENT! Invite some of your friends. SIGN UP AHEAD OF TIME FOR BONUS POINTS (and to help us get a headcount). Super excited to announce that local designer and podcaster Jennifer Steen will be at PLAYER#ONE to run some demo games of her new “PROJECT NINJA PANDA TACO”. Join us for another PLAYER#ONE event on Sunday December 2nd! We return to BARCADE PHILLY for the coolest tabletop gaming event in Philly! Enjoy a fun Sunday afternoon of playing board games, drinking craft beers and dropping quarters into Joust! Beer and Food Specials. $1 OFF ALL DRAFTS! FREE EVENT! Invite some of your friends. Sundays are BBQ time for Barcade! Their food is AMAZING! Check out the game we wrote- Demon Realms! It’s so REAL!